Oceanears low-cost underwater speakers and loudspeakers are designed for use in diver recall systems, synchronized swimming sound systems, marine mammal recording and playback sound systems and any other system needing a hi-quality, low-cost means of projecting sounds underwater. The OCEANEARS DRS-8 Portable Underwater Speaker is a state of the art Piezoelectric Flexural Disc Transducer that will provide years of reliable service and pleasing music underwater. The speaker comes with 25 feet of cable and uses our Pin Suspension Design. The Standard Warranty is FIVE Years. One speaker for a 25 yard 6 lane pool for music. Will not rust or corrode even if used in saltwater. Can be used in swimming pools with salt generators. Acoustic power to spare with high efficiency. Deep depth capability (130 feet/40 meters). 8.5 inch (21.6 cm) diameter. 2.2 inch (5.6 cm) axial length. Weighs only 4.5 pounds (2.0 Kg) in air. Supplied with 25 feet (15 meters) of cable (Suprene 105, 18 AWG, 3/C SE00W, (UL) 600V, -60C to 105C, CSA LL39753 ST00W (TPE) 600 V, water resistant FT2). Uses readily available Neutrik connectors. Underwater Speaker Input Impedance: 4000 ohms. Frequency range: 200 Hz to 32 KHz. Directional at higher frequencies. Omni-directional beam pattern at 2 KHz. Impedance varies with frequency but can be matched to 4 or 8 Ohm amplifier output tap with the included audio isolation impedance matching transformer assembly. 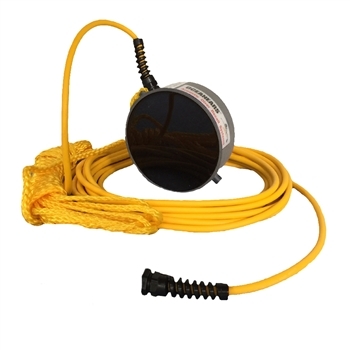 Can also be used as a receive hydrophone for underwater listening. The ONLY underwater speaker on the market that can be used as an air speaker without voiding the manufacturer’s warranty.